Wellman Furnaces features Rotary Hearth Furnaces for reheating in a controlled atmosphere before subsequent forging operations. Also used for hardening, stress relieving and annealing. 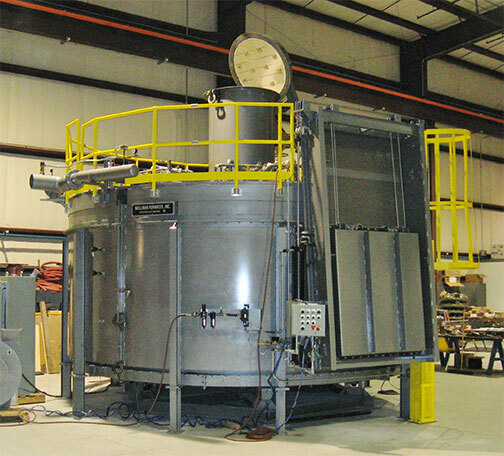 Wellman Furnaces' Rotary Hearth furnaces are useful for a number of processes including forging and forming, hardening, tempering, stress relieving and annealing. Units can be direct-fired or engineered for a controlled atmosphere with your choice of gas or electric heating. Temperature range to 2300°F (1260°C). Precise indexing of the rotary hearth on Wellman Furnaces designs is accomplished through a rack and pinion system and variable speed drive. Manipulators or custom designed load/unload equipment can be supplied.